The Mazda CX-3 is a subcompact crossover and it is the smallest crossover offered in Mazda's lineup of three available crossover SUVs. 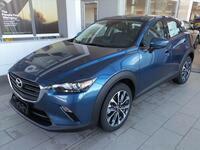 The subcompact crossover segment has been rapidly growing and the Mazda CX-3 isn't alone. Many brands are coming out with their own versions of subcompact crossovers because they give customers an affordable alternative to the larger SUVs that are available. Aside from being the most affordable crossover in its lineup, the 2017 Mazda CX-3 offers high fuel-efficiency and premium features. See for yourself in this comparison of the 2017 Mazda CX-3 vs 2017 Buick Encore. The 2017 Mazda CX-3 receives a fuel economy rating that is comparable to most sedans on the market. Rated at 29 city mpg and 35 highway mpg, the 2017 Mazda CX-3 allows drivers to hit the road and save time and money at the fuel pumps. The Mazda CX-3 offers all-wheel drive as well and though that decreases the fuel economy slightly, the 2017 Mazda CX-3 still comes out ahead of the competing 2017 Buick Encore. The Mazda CX-3 is powered by a 2.0-liter four-cylinder engine that delivers 146 horsepower. Aside from high fuel-efficiency, Mazda CX-3 drivers can expect responsive handling and an engine that delivers pep. The Mazda CX-3 may serve as the entry level of Mazda's three crossover lineup but that by no means that the Mazda CX-3 is any less equipped. The subcompact crossover features advanced technology and safety features all while giving customers a style that will turn heads. The base model, the 2017 Mazda CX-3 Sport starts off strong with standard features including automatic headlights, push-button ignition, Bluetooth, a rearview camera, a 7-inch touchscreen and more. Mazda also offers an i-ACTIVSENSE® package that includes automatic high-bean headlight control, automatic wipers, lane departure warning, adaptive cruise control and a forward collision mitigation system with automatic braking for the Grand Touring trim of the 2017 Mazda CX-3. If you are looking for an affordable crossover with sporty style, advanced features and impressive fuel economy contact us at Hall Mazda to talk with a sales team member about the 2017 Mazda CX-3. Use our website to find our contact information or schedule a test drive right from our website.